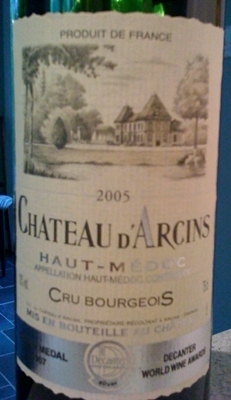 I was really in the mood for a Bordeaux the other night and this really fit the bill, another great Bordeaux from the 2005 vintage. Very approachable but could still go for another 5 years or so, with plenty of fruit, acid and tannins left to mingle with each other and keep developing this wine. Old wine sure does taste good! 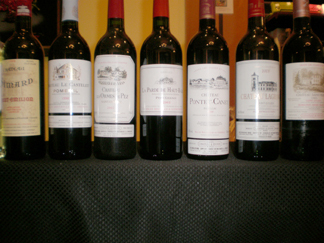 Last week I got the opportunity to taste some back vintage Bordeaux at Bella Vino Stony Point. We had 8 wines on tap for the evening from all over Bordeaux, from St. Emillion to St. Estephe. We started off the evening with the one white of the list and the youngest wine of the evening. Wine 1 – 2007 Chateau Ducasse Bordeaux Blanc (100% Sauvignon Blanc) $18 – Made by winemaker Herve Dubourdieu, most famous for his Sauternes, he uses the leftover Sauvignon Blanc to make this wine. This wine was fairly round so my guess it was aged Sur Lies since no oak was used in its production. I prefer Sauvignon Blanc’s to be crisper than this one was. It was an enjoyable wine but for $18 you can find a lot better examples of the varietal. Wine 2 – 1998 Chateau Simard St. Emillion (70% Merlot, 30% Cabernet Franc) $35 – This wine is usually released after 10 years of aging and the vineyards are a stones throw from the first growths. Wine 3 – 1998 Chateau Le Castelet Pomerol (100% Merlot) $32 – 1998 was a great vintage in Pomerol, that led to smooth age worthy wines. There was some debate on whether or not this wine was corked or if it had some induced brett that went a bit too far. I thought it was brett personally, the aromas didn’t give me the same nose and taste that TCA usually does. Taste – cherry, leather, cranberry, fresh raw green pepper, bandaid?? Wine 4 – 2001 Le Pardre de Haut-Bailly Pessac-Leognan (mostly Cabernet Sauvignon with Merlot) $40 – This is a second wine from this producer so it allows greater value from the region. Wine 5 – 2002 Chateau Les Ormes de Pez St. Estephe (70% Cabernet Sauvignon, 20% Merlot, 10% Cabernet Franc) $31 – From vineyards both North and South of the town of St. Estephe on the left bank of Bordeaux, this wine is another good value from the region. Wine 6 – 1999 Chateau Pontet-Canet Pauillac (61% Cabernet Sauvignon, 34% Merlot, 5% Cabernet Franc) $62 – Classified as a 5th growth, the vineyards for Pontet-Canet are neighbors to 1st growth Mouton Rothschild. Wine 7 – 2001 Chateau Lagrange St. Julien (65% Cabernet Sauvignon, 28% Merlot, 7% Petit Verdot) $62 – From the heart of the Medoc, this 3rd Growth, is the only one in line up to include Petit Verdot. 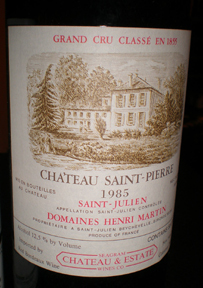 Wine 8 – 1985 Chateau St. Pierre St. Julien (75% Cabernet Sauvignon, 15% Merlot, 10% Cabernet Franc) $98 The grand finale of the evening so to speak, this 4th Growth was very smooth, evident of its 23 years of aging. The ’85 definitely was the highlight of the bunch, great funk, great fruit, super integrated tannins and acidity. My second fave was the ’99 Chautea Pontet-Canet with its great earthy, horsey notes, but it could’ve used a bit more fruit to go with it. 3rd favorite was the Chateau Simard (which I bought), great fruit, nice complex layers and a good price point. If you could have combined those two, it would have been perfect for my palate. 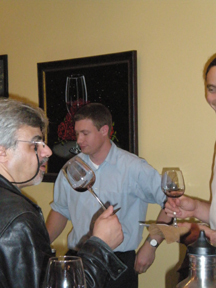 Thanks to Brad and David for the great tasting, it was definitely a great education for the palate.